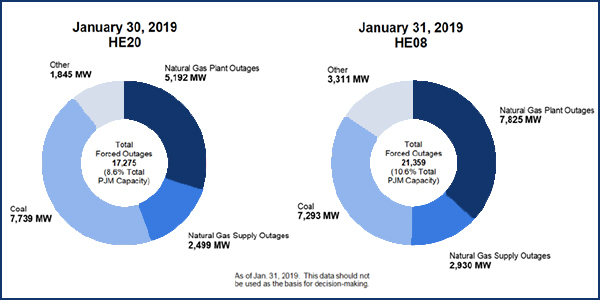 PJM survived last week’s arctic blast with slightly elevated outages and two periods of shortage pricing, officials said. The cold air hit the Commonwealth Edison zone near Chicago first, with actual temperatures dropping as low as -24 degrees Fahrenheit on Thursday morning. PJM issued cold weather alerts for the ComEd zone last Tuesday, PJM West on Wednesday and the entire RTO on Thursday and Friday. Forced generation outages peaked at 10.6% of total capacity Thursday (21,359 MW) after hitting 8.6% (17,275 MW) Wednesday. That was below the 12.1% (23,751 MW) on Jan. 7, 2018, the peak day last winter, and less than half the 22% (40,200 MW) of the 2014 polar vortex. Unit 2 of Public Service Enterprise Group’s Salem nuclear plant was forced to shut down at 3 a.m. Thursday after ice clogged the screens protecting its cooling water intake. Unit 1 also reduced power to 88% because one circulating water pump was shut down. Unit 2 was listed at 3% in the Nuclear Regulatory Commission status report Feb. 1. Load for the week peaked at 139,452 MW at 8 a.m. Thursday, with LMPs rising as high as $144/MWh and synchronized reserve prices hitting $102/MWh. Shortage pricing occurred both early Thursday and during Wednesday’s evening peak, following the forced outage of a generator in the western part of the RTO. Synchronized reserve prices hit $600/MWh in MAD and $300/MWh in the RTO, with energy prices peaking at $747/MWh for the RTO. PJM has found a way to provide generators with the performance assessment hour alerts that owners requested, but it’s not going to be easy.